← Happy New Year iPad Community! You don't need a table like the one above (courtesy of Gartner via Engadget) to see what's happening in tech sales today. You simply need to look around. More and more people are discovering that tablets – especially the iPad – are not only sufficient for the vast majority of their “computing” needs, they are in many cases superior. You see it on planes, in offices, coffee shops, homes, buses…everywhere. 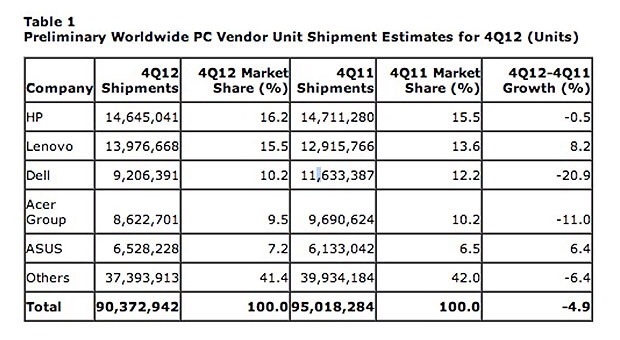 And the result is that PC sales are shrinking outright. Shrinking. Not growing more slowly, but shrinking. The incursion of tablets has offloaded so many activities from PCs that the reasons to upgrade a PC (or even a Mac…) are shrinking. On the hardware side, what most have is still good enough. On the software side it's been a while since Microsoft put any compelling new features into Windows. Windows 8 however marks a large shift in that OS, at least on the surface (ha). Its live-tile interface bears no resemblance to Windows 7 (even if the standard interface is a click away). And its in-built touch features are also a departure from prior desktop OS's. But so far it hasn't made a compelling case for itself in the marketplace. That could change soon. Once Windows 8 tablets (running full blown Windows, not RT) start shipping en masse sales will likely start to take off. I predict a rather large PC hardware upgrade cycle as people and corporations ditch XP-era hardware for Windows 8 units in the tablet form they've come to love in the iPad. Microsoft Surface isn't a bad piece of hardware, and running full blown Windows 8 should give it and its clones a strong footing in the marketplace. However, at 2 pounds and with a 4-5 hour battery life (and yes, those are the likely specs for the Surface Pro running full Windows 8) these things aren't going to dislodge the iPad overnight. In fact if anything I think they'll serve to push an explosion in sales of smaller and lighter tablets like the iPad mini, for use as companion devices, as people have come to want and expect as small and light a footprint as possible. This entry was posted in Hardware, iPad as primary computer, PC sales, Speculation and tagged Hardware, ipad sales, PC sales. Bookmark the permalink.